Muhlenberg students can study aerial acrobatics, history and philosophy of circus arts and perform in the Circus Workshop. It’s not every day that you see a student dressed as Rosie the Riveter spiraling gracefully toward the stage by way of aerial silks. But thanks to the Muhlenberg Circus Workshop, students at the small liberal arts college in Allentown, Pennsylvania, are taking their dance training to a whole new level—literally. From this beginning came what is now the Muhlenberg Circus Workshop, a multidisciplinary program that provides training, performance opportunities and even academic credit to the college’s growing circus arts community. Aerial class credits can be applied to dance-major concentrations in both performance and choreography, and, while students don’t earn academic credit for performances at Muhlenburg, the performances count toward the school’s co-curriculum and lab requirements. Sixty students auditioned for approximately 20 slots in this year’s production. Dearborn eventually developed a class on circus history and philosophy to provide the aerial students with an academic grounding, but it was a couple of visionary undergraduates who realized their school was ripe with big-top talent. New York native Henry Evans trained as a competitive gymnast and came to Muhlenberg to pursue a double major in theater and business. His roommate, Noah Dach, had a friend who wanted some help choreographing a Cyr wheel routine. There was only one problem: They had nowhere to perform. Performances initially took place in a dance studio that had been specially equipped for aerial silks, but since founding the Circus Workshop in 2013, they have expanded into Muhlenberg’s theaters. The college hires a professional rigger to ensure the students’ safety, and students receive specialized training that targets the muscle groups required for aerial work. 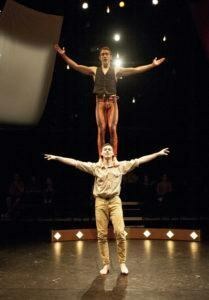 Henry Evans (on the shoulders of Tommy McCarthy) started the Circus Workshop with roommate Noah Dach. “We have been able to advance from fixed points to flying the apparatus while the aerialist is performing,” explains Dearborn; this allows the aerialist to be moved up or down. In February, she created a work for eight male students that featured four fixed apparatuses and four that flew. 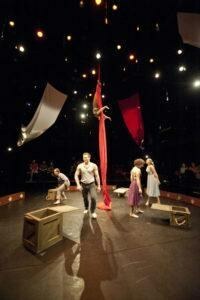 The Circus Workshop’s most recent production, VOD, included a flying apparatus as well, but only the most advanced students are allowed to use it. “Many of our dancers have found employment after graduation because of their circus skills,” says Dearborn. In addition to two levels of aerial acrobatics and Dearborn’s history and philosophy of circus performance class, students can study commedia dell’arte, puppetry, performing magic and clowning, offered by the theater department. They also have the option of enrolling at the Accademia dell’Arte in Arezzo, Italy, during their junior year to study physical theater. Acrobatic training has helped dancers in other ways, as well: the development of core and upper-body strength, improved control and balance and better partnering technique overall. Evans and Dach, now graduates, have started their next venture: Atlas Circus Company, through which they hope to eventually create a center for circus arts in America. 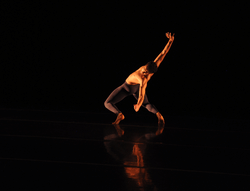 Kat Richter is a writer, dancer and professor of anthropology. She lives in Philadelphia.